How Effective Is Your E-appeal Donation Form? When was the last time you checked out your online donation form? How easy is it to use? Do you know how many donors have made a gift online in the last year? It's time to ensure your 2016 online fundraising efforts are first-rate. Your donation forms are vital to the success of your e-appeals and emails that accompany a direct mail campaign as well as the overall results for your fundraising during the year. We ran a year over year comparison from September to October in 2014 and 2015 to see if a $75 pre-selected gift amount would improve the overall giving for Animal Legal Defense Fund. 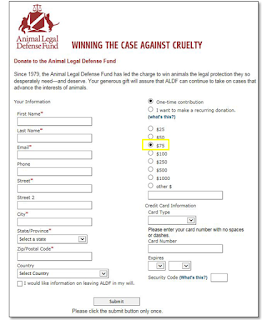 In 2014, ALDF was linking to a donation form that used $50 as a pre-selected amount for the donation and in 2015 that gift amount was increased to $75. The e-appeal was partnered with a donation matching opportunity campaign that was sent via direct mail.